Our corporate heroes hit a snag. We have long grinned painfully at the ways in which Corporate America and analysts collude to present the quarterly earnings charade in the rosiest light possible. But now, it seems they have reached the end of their magic tricks, and reality is showing through in an increasingly terrible trend. Analysts concoct sky-high earnings-per-share expectations for quarters in the distant future to obtain “forward-looking,” pro-forma, adjusted, ex-bad-items fictional P/E ratios that they then bandy about to raise “price targets” and justify ludicrous stock valuations. As the actual quarter draws nearer, these earnings expectations get whittled down to where very little earnings growth is left, if any. This way, corporations have a good chance of beating them, and thus propping up their stocks via an “upside earnings surprise.” If they get it right, it works like a charm. Over the past four years, 72% of the S&P 500 companies have managed to report higher earnings per share than the analysts’ mean estimates at the time, according to FactSet. And so earnings growth has been on average 2.9 percentage points higher than the mean estimate at the beginning of the quarter, “due to the large number of upside earnings surprises,” as FactSet puts it. Now the bad news. Currently the S&P 500 companies are projected to report a year-over-year decline in earnings of 4.4% for the second quarter, on a revenue decline of 4.2%. Of the companies in the index, 24 have already reported, which nudged up the estimates at the beginning of Q2, when the earnings decline was pegged at 4.5%. So everything is estimated to head south. Companies are blaming the dollar, in addition to the weather and a slew of other things. Instead of losing value as it had been for years, the dollar has regained some inconvenient oomph. And inflation has been too low for our corporate heroes. A declining dollar and more inflation would have masked the earnings and revenue debacle. Not this time. But consumers, for once, are spared the pain of experiencing how their stagnant earnings lose value every time they shop. Biggest culprits in the earnings and revenue debacle are the energy sector, industrials, and consumer staples, with Tech essentially flat. Despite the hype, Big Tech (that’s what is in the S&P 500) has stopped being a growth industry long ago. But healthcare is, as always, relentlessly booming and eating up an ever larger share of GDP. 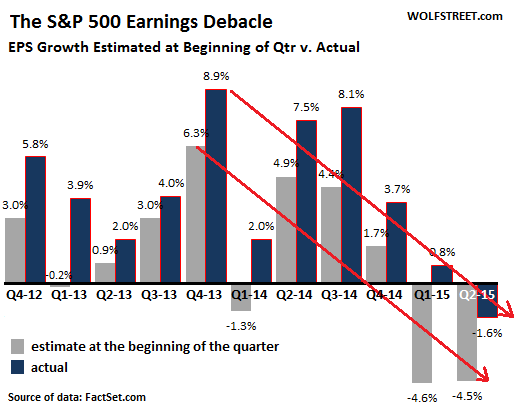 If this estimated earnings decline of 4.4% is the final number for Q2, it will be the first decline since Q3 2012, when earnings dropped 1%, and it will be the largest decline since Q3 2009, when earnings plunged 15.5%. If the revenue decline of 4.2% is the final number for Q2, it would be the first such decline since Q3 2009. These are not exactly hot numbers. Don’t despair. Companies will beat these numbers with plenty of positive “earnings surprises” in the weeks to come, given all the expert financial engineering that goes into these numbers. But they might not be able to beat them by enough to get them into the green. Over the last four years, actual earnings were on average 2.9 percentage points higher than estimates at the beginning of the quarter. If it works out this way for Q2, earnings would still decline by 1.6%, which would still be the worst earnings debacle since the Financial Crisis. How far from the maddening crowd will short sellers have to run? ” ..now it may be true that figures can’t lie, but I sure know liars who can figure”. ANALysts and chimps over at CNBC are enamored by the #s lubed with non-GAAP (adjusted earnings) and joke of all joke mark to market financial wizardry “awarded” to the market in 2009 where the underlying assets are no longer good ol book value but souped up “current market value”. As for beating the numbers – what a crock as the #s are guided low thru out the quarter and ANALysts just laps it all up and voila company beat the whisper #s! The figure seems inconsistent with the text, i.e., high estimates followed by lower actuals. Is the figure mis-labelled? The estimates are high for quarters in the distant future to push up stocks with “forward-looking” P/E ratios that are fictional. As that quarter approaches, estimates are chopped down to where they’re very low at the beginning of the quarter for which earnings reports are due. When companies report that quarter’s earnings, they then can beat the lowered estimates. Hence the “upside earnings surprises.” But these earnings are much lower than the estimates for those earnings had been a year earlier. The chart shows the estimates (gray) at the beginning of the quarter being reported on vs. actual reported earnings (dark blue) for that quarter. At that point in time, on average, the estimates are always lower than actual. Thanks for the clarification! Enjoy your site, btw. Dotcom turned into dot gone. Corporate heroes will eventually be viewed as corporate zeros. Looks to me like the decline tracks pretty close to the QE taper. Growth? What growth? It’s all fake, people.